ThinkWeights are carefully machined sculptures of important numbers like PI, formulas, or diagrams intended to be displayed on your desk. The origin of the idea came from an experiment with Newton's Anagram of Calculus, which we engraved into metal and left on a desk in two major high-tech R&D labs. Work in the departments came to a stop while the engineers speculated on what it meant. ThinkWeights are supposed to start conversations, as well as being a handy reference for very precise calculations. ThinkWeights are made by rotary engraving letters and numbers deeply into aircraft-grade aluminum. These will last for centuries, providing a handy backup reference for future generations. ThinkWeights displaying the irrational numbers PI, e, and phi show 39 digits. We picked this number because 39 digits are said to be sufficient to describe a circle the size of the known universe to the accuracy of a Hydrogen atom. While we haven't done a rigorous proof of this claim, we do feel that 39 digits should be sufficient for daily use. If new measurements of the expansion of the universe require a 40th digit, we'll be happy to oblige. If you would like to make a purchase, please use our contact page. PI has stimulated an amazing amount of research over the years. 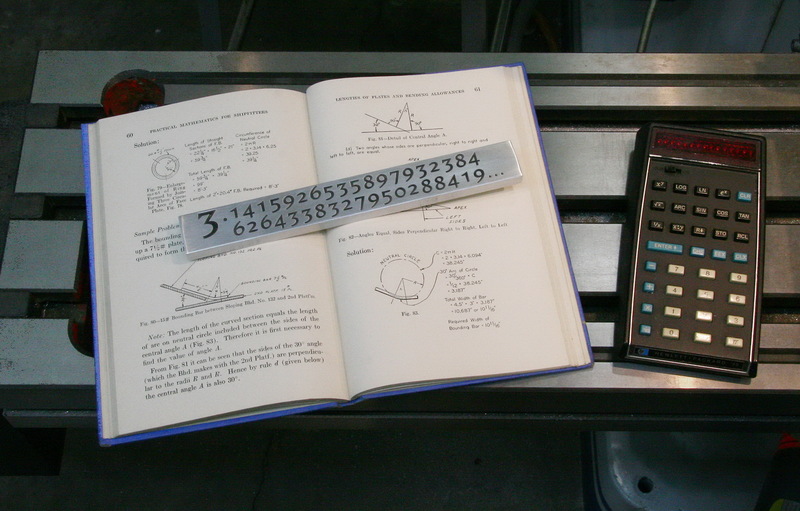 In computer science it's considered sport to compute as many digits of PI as possible. This paperweight showing PI would be a great gift for the math enthusiast, engineer, or anyone with a fascination for geometry. PI stands out as the most famous of the irrational numbers but is a very rational gift for yourself or a friend. e is the base of the natural logarithm. An irrational number like PI, e is calculated as the sum of a series expansion. While we don't have as clever a use for 39 digits of e, its importance in mathematics is immense. John Napier has been credited with original work on logarithms, and is perhaps more well known for that work than for Napier's Bones, reproduced here as well. phi is often called the "Golden Ratio" or "Golden Mean", and is calculated by dividing a line into two parts so that the full length divided by the longer part is equal to the longer part divided by the smaller part. Perhaps the most common geometrical shape illustrating the golden ratio is a credit card. We're quite confident that this would be a great gift for artists, architects, and anyone else with a keen sense of design. Sir Issac Newton, famous for many innovations, used an anagram to encode his method of fluxions. In Newton's time it was fashionable to encode intellectual innovation as anagrams to conceal their meaning yet be able to claim first publication of an idea. This anagram was used in a letter to his rival Leibniz in 1677, giving the letter counts for Data aequatione quotcunque fluentes quantitates involvente, fluxiones invenire: et vice versa. Pioneer 10, was launched in 1972 and has become the first spaecraft to leave our solar system. Fastened to an antenna support strut is a plaque intended to help another civilization decipher Pioneer's origin. This ThinkWeight evokes the artwork at the bottom of the plaque - the idea being to start a conversation about the Pioneer mission. Drake's Equation is more of a guide to estimating the number of civilizations that we might communicate with (or discover Pioneer 10) than an exact formula. The terms are star formulation rate, fraction of stars with planets, fraction of planets that could support life, fraction of planets that actually develop life, fraction of planets the develop intelligent life, fraction of civilizations that transmit their existence, and the length of time those transmissions persist. There are great resources on the Internet that discuss PI and the utility of 39 digits. The video Pi and the size of the Universe by Numberphile has an entertaining discussion of 39 digits of PI. Calculation details can be seen at: Long Numbers (Pi and the Universe) from Ken Ward's Java Script Tutorial. Wikipedia has articles about the Pioneer 10 mission and Drake's Equation.